SmartCalcs users and Amazon, Shopify, and BigCommerce sellers who sell products with special tax rates for exemptions (such as Groceries, Supplements, Clothing, etc.) can now classify those products as exempt by categorizing your products from the Exemptions tab of your account's navigation bar. Please note that we do not yet support product taxability for ALL of your Linked Accounts. We currently support this feature for Amazon, Shopify, BigCommerce and SmartCalcs. We have support for additional carts coming soon. If you have a combination of unsupported carts connected to your TaxJar account, you will not be able to use this feature until we support exemption categorization for all carts your have Linked to TaxJar. Please contact TaxJar Support to be notified as soon as we add product categorization support for your other Linked Accounts! WHICH CARTS ARE CURRENTLY SUPPORTED? ALL OF MY LINKED ACCOUNTS ARE SUPPORTED; HOW DO I GET STARTED? 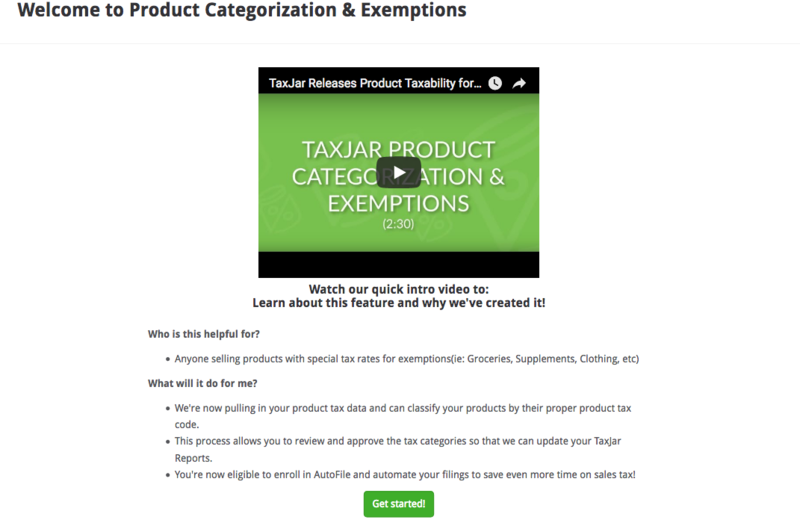 The video on this page, as well as the text on the Exemptions page in your account, will have all of the details you need to get this set up inside of TaxJar. Once you categorize your products, we will pull in your product tax data to classify your products by their proper product tax code. This process allows you to review and approve the tax categories so that we can update your TaxJar Reports. WHICH PRODUCT CATEGORIES ARE SUPPORTED? We support the categorizing your items into the Product Tax Categories shown here.